So you’re looking to pick up a tablet, and you’ve got your shortlist down to choosing between an iPad or a Fire tablet. Which one should you opt for? The answer really depends on what you want to use your tablet for. Want to catch up on social media, stream the latest episode of your favorite series, and do so as cheaply as possible? Then an Amazon Fire could do the job. Want a tablet with innovative features that will last you a long time, and willing to put in a bit more financial investment for it? An iPad it is. Keep reading and we’ll talk you through the full pros and cons of the iPad and Fire tablets, to help you decide which one to go for. Everyone knows about the iPad. Even if you’ve never owned one, you’ll most certainly have used one at some point. iPad owners tend to be loyal to their products, thanks to the combination of great design, power, and a buttery smooth user interface which makes using them so enjoyable. If you want a powerful tablet that will last you for years, and which supports a huge range of apps, the iPad is the one to go for. Since its introduction in 2010, the iPad has become synonymous with tablets – and with good reason. 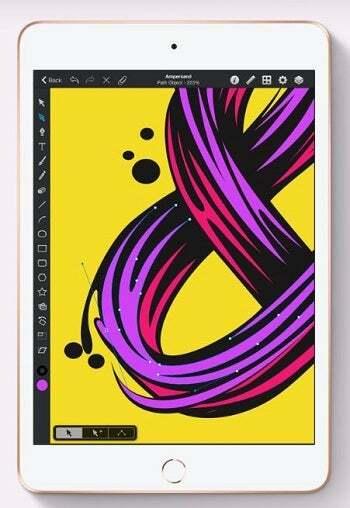 The line up offers a good variety, but in most cases, we’d suggest the iPad 9.7 – it’s very much the everyman of the range, offering up a vivid screen, light and portable build, and an A10 processor capable of some fairly heavy lifting. The recent addition of stylus compatibility is a nice touch, too. The iPad Air has been given a refresh, making it one of the most recent releases in Apple’s tablet line-up. The A12 processor makes it more powerful than the standard 9.7-inch model, but doesn’t quite rival the firepower of the Pro series. It’s a good compromise for those that need a bit more muscle but don’t have the budget for Apple’s Pro range. The iPad Mini had been left unloved by Apple for several years, but a recent update has made it a serious contender. Packing in an A12 processor, it’s essentially the iPad Air in a smaller package, and is now compatible with the Apple Pencil. It’s more expensive than the iPad 9.7, but the specs justify this, and it’s a powerful iPad device, perfectly replicated on a smaller scale. The Pro models are designed for those who need a little extra firepower from their iPad, with the A12x processor under the hood easily juggling the tasks of the most demanding users. The large screens are also a great boon to creative types. The Fire tablet is Amazon’s answer to the iPad, in much the same way that your local supermarket offers its own brand alternative to popular chips – it’s notably cheaper, but cuts a few corners, and just isn’t quite as good. Amazon’s Fire tablets use a variation of the Android operating system named FireOS, which is controlled by Amazon and doesn’t offer the level of freedom to users that a standard Android tablet would. It also doesn’t share the Google Play store, instead operating its own Amazon app store. This means that it doesn’t have the same wide library of apps to choose from compared to Android’s own platform. One positive is that the Amazon Fire tablet is designed with the Amazon ecosystem in mind, so it’s well suited to anyone that already subscribes to Prime. Amazon tablets are now Alexa compatible too, meaning that you can give the tablet voice commands instead of having to use the screen. The best part about the Amazon Fire tablet is the cost. The Fire range can’t compete with the iPad on specs, but for the price, it’s hard to argue with the incredible value for money offered by Amazon’s range, making it a great deal for those working to a limited budget, casual users, or children. When it comes to choosing between a Fire tablet or iPad for an everyday all rounder, it’s hard to argue against Apple’s slab. While it’s notably more expensive (twice as much as the Fire HD 10), you can feel where the money has gone. From the powerful processor to the crystal clear screen and the easy to navigate interface, the iPad is a great daily companion, able to tackle everything in its stride. The Fire range, by contrast, doesn’t have the same sense of polish. If there’s one thing that Amazon has cracked with its tablets, it’s price. Never afraid to undercut the competition, the Fire tablet range starts at $49.99 for the entry-level Fire 7. Sure, it’s no powerhouse, but you’ll be lucky to find a cheaper tablet with equivalent specs (especially one from such a well-established company). It’s also regularly discounted to $35 throughout the year. By comparison, the iPad range starts at $329 for the 9.7-inch, and while you get a lot more tablet for your money, you could buy six Fire 7’s for the same amount – nine if they were discounted. Even the more ‘expensive’ Fire tablets represent great value for money: The Fire HD 8 is $79.99, while the Fire HD 10 – arguably the closest in the range to the iPad – is just $149.99. While the Fire tablet is Android-based, users don’t have access to the traditional Google Play store, and instead must download apps from Amazon’s own curated app store. There’s a lot of parity across the two stores, but there are some important apps that Fire owners can’t download – the most obvious of these is the lack of official Google apps, like Gmail and YouTube. It can also be slow to get some of the latest apps and games compared to the Apple store, where apps typically land first. Apple’s Appstore is also a much more user friendly experience, with a highly polished UI that makes finding the apps you want a breeze. By comparison, Amazon’s Appstore feels more like a garage sale – there’s much less signposting and categorization, meaning it will take you longer to find the right app (if it’s even there at all). In terms of sheer number of apps, the Apple app store boasts over 2 million compared to Amazon’s 450,000+. Both the iPad and Fire tablets have a suite of parental controls, and it’s possible to restrict the content that your children will have access to. However, Amazon actually offers Fire models designed specifically for kids, with the Amazon Fire 7, HD8 and HD10 all available in kid-friendly forms. What this entails for the most part is the addition of a large case, to help the child grip the tablet and to protect it from sudden visits to the floor. 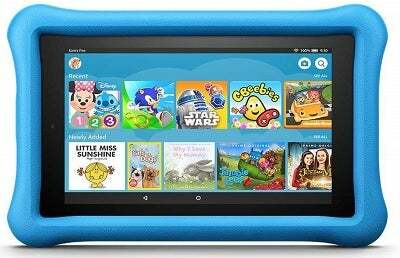 In addition, the Kids Fire tablets come with a no quibble two year guarantee, meaning that Amazon will replace it, no questions asked, should your child get a little too rough with it. The Kids range of Fire tablets starts at $99. We’d recommend the Kids Fire tablets for young children, but older kids may feel like they are missing out on the popular apps which are rife on the iPad, but not on the Fire (Fortnite is one such example). Also, the Fire doesn’t have the wide range of educational apps that the iPad does, so if your child needs a tablet for study, the iPad is worth the investment. There’s little to choose between the iPad and the Fire when it comes to battery life, as both offer around ten hours of use at a time (although the entry-level Fire 7 can only manage 8 hours). For most users, a tablet that offers ten hours is more than enough to get you through the day. Whether you’re watching films or keeping up to date on social media, you’re unlikely to see the red battery indicator on either; unless you’re really binging on your favorite show! Despite the chasmic price difference, the Kindle HD 10 is the closest contemporary of the iPad, although we’d barely call it a fair fight. 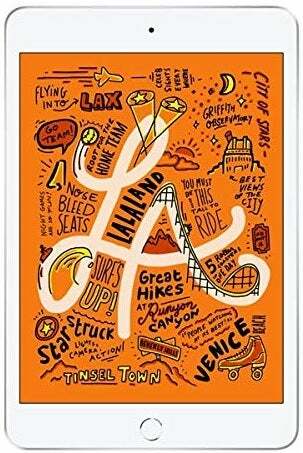 While the Fire HD 10 boasts the range’s most powerful processor, with a quad-core 1.8GHz MediaTek MT8173 chip, the iPad’s A10 leaves it for dust in terms of raw processing speed. In real terms, this means that only the iPad can handle demanding apps and multi-tasking without stuttering or slowing down. Both tablets have 2GB of memory, but it’s the iPad that is able to utilize it, while the Fire HD 10 has to focus on one app at a time. There is one aspect where the Fire HD 10 has the edge – storage. Unlike the iPad, Amazon allows you to use a micro SD card to expand storage space, and cheaply too. With an iPad, if you want more local storage space, you have no option but to buy a new, bigger iPad. So, the iPad is the best tablet, hands down, on paper. However, if you’re not too bothered about all the bells and whistles, the Fire HD 10 is a far cheaper option – it’s simply more of a compromise. If you’re considering a smaller tablet, then two of your options are the iPad Mini or the Fire 7/Fire HD 8. Both tablets occupy the space between a traditional tablet and a large phone, with the iPad Mini having a screen size of 7.9 inches. By comparison, the Fire 7 and HD 8 have seven and eight inch screens respectively. Let’s tackle the most obvious discrepancy first – the price. The Fire 7 costs $49.99, the Fire HD 8 $79.99, and the iPad Mini, $399. The main reason for this huge difference in price is that the Mini is packing in some serious tech. With its A12 processor, the Mini is actually more powerful than the iPad 9.7-inch, and on a par with the iPad Air. Then there’s the Full HD display, the 3GB of RAM and Pencil compatibility…while the two devices share a similar size, they are entirely different beasts. While the Fire 7/HD 8 might not be able to tackle the iPad when it comes to specs, the iPad cannot compete on price. The Mini’s recent update means that if you buy one now you can be confident it won’t be replaced for some time, but the real question is do you need the extra power and features of the Mini, or could the much cheaper Fire 7/HD 8 be a better fit? 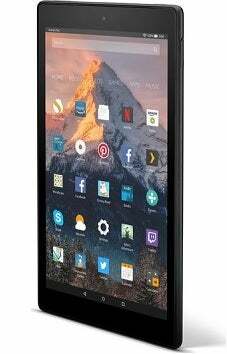 For casual users who aren’t too bothered about having the latest gadgets and can put up with the odd niggle here and there, the Fire HD 8 is likely to tick most of the boxes for a fraction of the price. The Fire tablet line-up offers a good experience, but Apple’s devices are far more powerful and polished. If you want a fantastic tablet and don’t mind paying for it, then Apple’s iconic device is the one to go for. If you just want to hop online on occasion, fire up the odd app, and check social media, then the Fire series is more than viable, and it all comes back to that main selling point – the price tag.